Federation University Australia > About us > Our university > Our history > Geoffrey Blainey Research Centre > Honour Roll > WILLIAMSON, William T.
The Williamson family lived at Smythesdale, moving to Ballarat for the education of their four children. The eldest child, William, attended the Ballarat High School and planned to seek employment with the Victorian Railways. Always interested in drawing he entered some of his work in the Amateur Art Exhibition of October 1913, organised by the Ballarat Ladies Art Association and held in the Ballarat Town Hall. Walter Withers, Mrs MacGeorge and former Ballarat art student Ponsonby Carew-Smyth were judges. Bill Williamson won a prize in the 'Drawing a Plant' section. 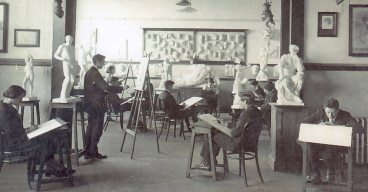 Carew-Smyth, at that time the chief Education Department Art Inspector, recommended Bill enter the Ballarat School of Mines (SMB) Technical Art School and train as a teacher. Bill took up the suggestion and became an Art and English in technical schools, eventually being appointed Headmaster. Bill Williamson's sisters Daisy and Minnie both became teachers, while brother Hugh joined the Ballarat branch of the Bank of Australasia in 1916. Forty-five years later he retired as General Manager of the ANZ Bank. The Hugh D.T. Williamson Foundation has funded many projects in and around Ballarat, including the Ballarat Fine Art Gallery, Ballarat Mechanics' Institute, Her Majesty's Theatre, and the University of Ballarat's tapestry 'Diggers' woven by the Victorian Tapestry Workshop. Hugh D.T. Williamson felt a sense of gratitude to Ballarat for launching himself and his brothers and sisters on happy and successful careers. This biography researched by Clare Gervasoni, August 2008.